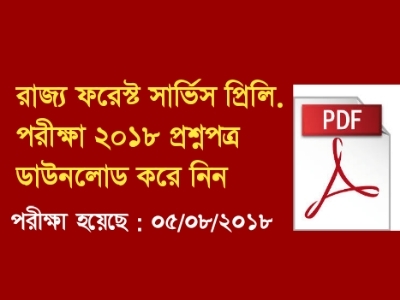 Hurry Up Download West Bengal Forest Service Prelims Exam 2018 Question Paper Download. Today West Bengal Forest Service Prelims Exam is complete. Most of the Students waiting for this Question Paper. Previous Year question paper helps you to better preparation. So candidates who are preparing for the WB Forest Service Exam next year, this question paper is very important for you. Today GK Solve share West Bengal Forest Service Exam Prelims Question Paper 2018 download share link. So all the Aspirants are requested to download this West Bengal Forest Service Exam Prelims Question paper easily from our website. We daily update Competitive Exam materials on our website. West Bengal Forest Service Exam Prelims question Paper 2018 below here. Click Here West Bengal Forest Service Preli Exam 2018 Question Paper Download.